No limit! is the name of the exhibition taking place from January 19 to April 7, 2013 at L’Atelier Renault on the Champs Elysées in Paris. On this occasion, l'Atelier Renault offers to relive the adventure of the vehicles that made history, illustrated by Christophe Merlin’s comic strip drawings. Visit the "No limit!" exhibition as if you were reading a comic strip, telling the story of Renault. "No limit!" 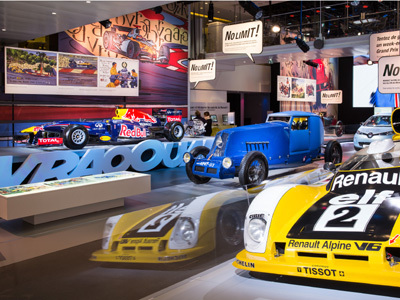 illustrates the Renault brand's values of courage and innovation through a collection of record-breaking vehicles. The Type K, the 40 CV, the “Etoile Filante”, the Alpine Le Mans A442, the F1 car with its RS27 engine, Mégane RS Trophy and ZOE are all heroes of the brand's history, which is built on the adventures and the exploits of the vehicles on display. Learn how these extraordinary vehicles and constant new challenges have pushed back the limits of automotive innovation, and continue to do so. Read their stories, staged in a comic strip-like décor by Christophe Merlin. Christophe Merlin is mad about cars. This talented illustrator manages to capture the sound, speed and fury of motor cars, as his comic strip "The Nürburgring 57" clearly demonstrated. His numerous albums for young readers have been published by Albin Michel, Le Seuil, Nathan and Milan. He has also written several travelogues and comic strips, always with same graphical excellence. "What a dream to see these on the road ! Or even to drive them!" "The F1 wheel looks like a Playstation"
More on our guests on their blogs: Luchie, Malec, Jeromeuh, Un dessin par jour, Yap. In the afternoon of Saturday March 2, Christophe Merlin will be autographing the comic book of the exhibition, published in cooperation with Glénat, in a session open to the general public. The comic strip will be gifted to the visitors. Open daily from 10:30 am to 11:30 pm (and to 1:30 am on Fridays and Saturdays), L’Atelier Renault organizes special events year-round on Renault and the latest Renault news. The "L’Atelier Renault Café" restaurant-bar, with its suspended walkways and mezzanine, welcomes you all day long to enjoy a relaxing moment on the most beautiful avenue in the world. L’Atelier Renault also hosts a vehicle sales bureau, the Renault boutique, which sells brand merchandising, and a free Wi-Fi hotspot.